The Man-Thing (Dr. Theodore "Ted" Sallis) is a fictional monster, appearing in books published by Marvel Comics. Created by writers Stan Lee, Roy Thomas, and Gerry Conway and artist Gray Morrow, the character first appeared in Savage Tales (May 1971), and went on to be featured in various titles and in his own series, including Adventure into Fear, which introduced the Character Howard the Duck. Steve Gerber's 39-issue run on the series is a cult classic that was influential on such writers as Neil Gaiman. 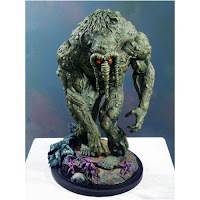 Man-Thing is a large, slow-moving, empathic, humanoid creature living in the Florida Everglades near the Seminole reservation and the fictitious town of Citrusville - More about Man-Thing Character Review...keep reading !! 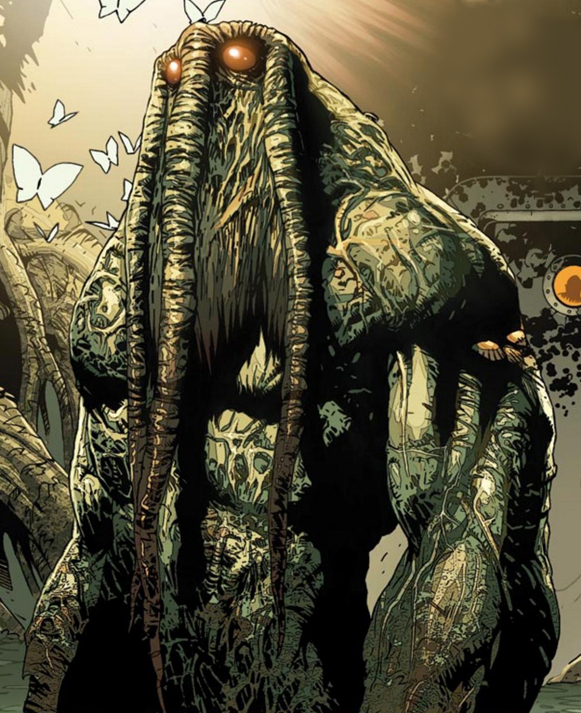 Man-Thing is a former scientist who was transformed into a creature composed of vegetable matter through the synergistic interaction of mystical energy and chemical mutagens. Though the creature now lacks a normal human intellect and has shed any desire to communicate with human society, it nevertheless often becomes an accidental hero as it stumbles upon various crime and horror scenarios. In the pages of the Thunderbolts, Dr. Henry Pym has expressed the view that the Man-Thing is sentient, though difficult to communicate with. For example, he once rescued an infant and left the child with a doctor (which would require an understanding of the function of a doctor and the ability to navigate to a specific address). He is shown to understand concepts such as how to ring a doorbell, how to put an arm in a sling, and even how to flip an auto-destruct switch. The change in Man-Thing's intellect can partly be explained by fact that its brain, sensory organs, and central nervous system are now organized in a completely different fashion than a human; for instance, Man-Thing's auditory receptors are in his forehead. Regardless of what level of humanity the creature still possesses, it can discern when a person's motivations are evil, which causes it pain and motivates it to lash out. 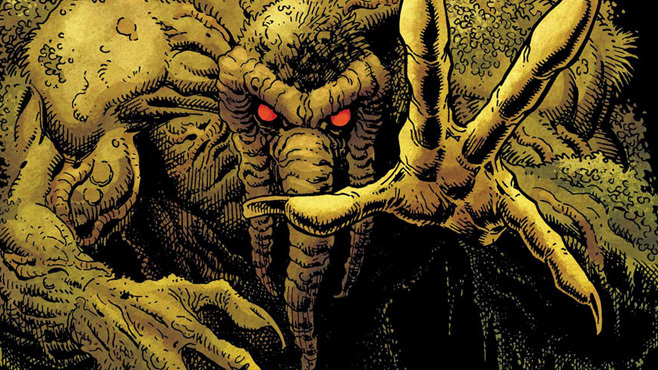 The Man-Thing possesses a variety of superhuman powers, described below, that are derived from the interaction of the scientific formula created by Ted Sallis and the mystical energies of the Nexus of Realities. 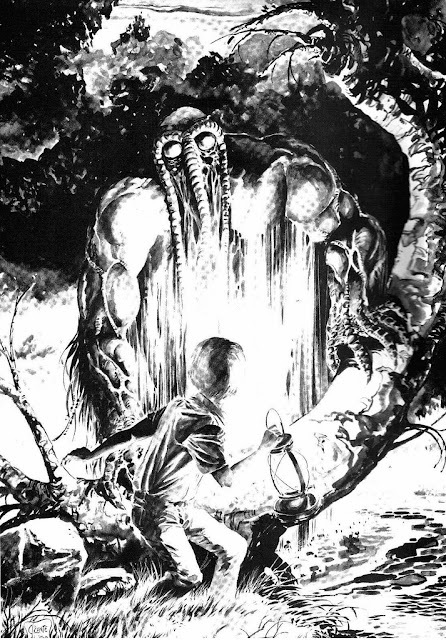 It is able to sense human emotions, and is enraged by fear and automatically secretes a strong chemical corrosive; anyone feeling fear and clutched by the Man-Thing is prone to be burned (either chemically or mystically), hence the series' tag-line, "Whatever knows fear burns at the touch of the Man-Thing." Though fear is understandably most people's response to the creature, both for his monstrous appearance and the physical danger of his touch, typically only villains end up meeting an immolating death at its hands. Many survive being burned, notably Ellen Brandt, Kurt "Nightcrawler" Wagner, whom he does not even scar, and Mongu, whose hand he permanently attaches to his axe, either due to intervention or dissipation. Unusual psychic and mystical forces react in what passes as the "brain" cells located throughout his body. These unique forces render the Man-Thing extremely sensitive to emotions. Emotions that are mild and generally considered positive arouse curiosity and the Man-Thing will sometimes observe from a distance. However, emotions that are often viewed as negative, such as violent emotions, rage, anger, hatred, and fear, cause the Man-Thing great discomfort and might provoke him to attack. Once provoked into violent actions, his body secretes highly concentrated sulfuric acid that can burn human beings to ashes within a matter of seconds. Even individuals that have high levels of superhuman durability have proven unable to withstand this potent acid. While the Man-Thing is devoid of violent emotions, his body produces a type of foamy, soapy mucus that neutralizes the acid. Although Man-Thing's superhuman strength varies considerably in his comic book appearances, it has been established that the creature possesses physical strength beyond the limitations of any human athlete. Initially, the Man-Thing is only slightly stronger than Captain America, but in later appearances, the Man-Thing possesses sufficient superhuman strength to stand toe to toe with much stronger villains. He is able to lift a 2,000 pound automobile when sufficiently moved to do so. The Man-Thing's body is practically invulnerable to harm. Because his body is not entirely solid, but composed of the muck and vegetative matter of the swamp, fists, bullets, knives, energy blasts, etc. will either pass entirely through him or will harmlessly be lodged within his body. Even if a vast portion of the Man-Thing's body were to be ripped away or incinerated, he would be able to reorganize himself by drawing the necessary material from the surrounding vegetation. Devil-Slayer once sliced him nearly in half, and he has survived being incinerated by a Celestial, although his healing from the latter has been the longest and most complex in his lifetime. Due to the construction of his body, the Man-Thing is able to ooze his body through openings or around barriers that would seem too small for him to pass though. The smaller the opening, the longer it will take for him to reorganize his mass upon reaching the other side. This ability, can be defeated mystically. 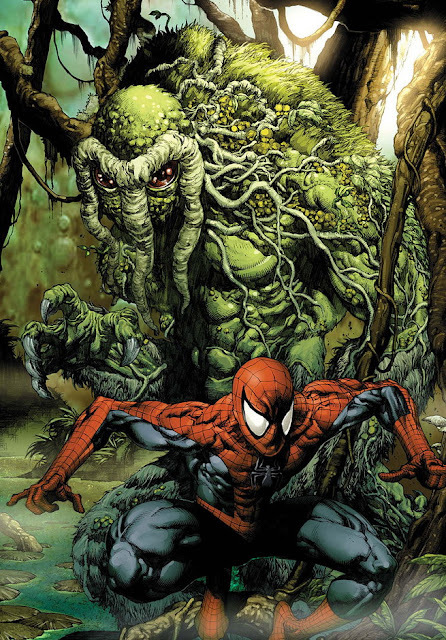 The Man-Thing was once dependent upon the swamp he inhabits for his continued survival; his body would slowly weaken and eventually lapse into dormancy if not returned to the swamp or would be greatly damaged if exposed to clean water. His exposure to the Citrusville waste treatment plant greatly enhanced his ability to leave the swamp, as he became a self-contained ecosystem, feeding off his own waste products. He generally leaves the swamp of his own accord only if he senses a mystical disturbance. Man-Thing has also demonstrated himself susceptible to possession by other entities. Although the Man-Thing lacks a normal human intellect, in its life as Ted Sallis, it possessed a Ph.D. in biochemistry. Sallis is legally dead, but his identity is known to numerous living people, including Wilma Calvin, Ellen Brandt, Stephen Strange, Owen Reece, Ben Grimm, Thog, and Jennifer Kale, and anyone they may have told. His identity as Man-Thing could not be considered secret, but his existence is generally believed to be a hoax, and an obscure one at that. In-universe, knowledge of his existence is rarely tied to the experiments of Sallis, as are speculations as to any human identity he may have had. Despite having appeared in Citrusville many times, many there still believe him to be a rumor. Man-Thing, a TV-movie directed by Brett Leonard and written by Hans Rodionoff, premiered on the U.S. Sci Fi Channel, under the Sci Fi Pictures label, on April 30, 2005. An uncut version appeared on DVD June 14, 2005. Produced by the studio Lionsgate, it is based loosely on a Steve Gerber storyline involving the unscrupulous land developer F.A. Schist. Three characters are named after some of the original comics' creators: Robert Mammone as "Mike Ploog", William Zappa as "Steve Gerber", and director Leonard himself as "Val Mayerik" (misspelled "Mayerick" in the credits).